Tetris is an arcade style game created in the mid 1980’s that is made up of 7 different shaped blocks that fall down the vertical rectangular screen and fill up the bottom. The objective of the game is to align the pieces so they fit together in such a way to form a solid horizontal line. That line is then cleared and points are awarded. Each of the 7 different blocks (sometimes called tetrads or tetrominoes) that fall down the screen are different colors and shapes, as seen in Figure 1. They are all composed of 4 squares each. According to Tetris manuals, the shapes are referred to as I, J, L, O, S, T, and Z, respectively. The pieces are selected at random to fall down the screen. Until they reach the bottom and are set into place, the player may rotate each piece by 90 degrees and move the piece left and right. When a line is cleared, the pieces above it will move down according to the height of the lines cleared. If 1 line is cleared, the lines above will move down equal to the height of 1 line. If 2 lines are cleared, the lines above will move down equal to the height of those 2 lines, and so on. This will leave some blocks suspended above a hole. The blocks will not fall into the open spaces, but rather stay suspended above them so that you can get to them later and clear that line. You may run into a problem or two that you don’t think can be fixed, but this is most likely not the case. Sometimes you will start the game off with an ‘S’ piece or a ‘Z’ piece, which creates a problem. Neither piece will lie flat on the bottom; there will always be a gap in your line. There is an easy fix though, so don’t be discouraged! Rotate the ‘S’ or ‘Z’ piece however you like, and bring it all the way to the bottom. Now depending on what piece is next, rotate it so that you can slide it underneath the ‘S’ or ‘Z’ and let it fall by itself. Once it gets far enough down, hold down the right or left arrow (depending on which side the gap is on) and wait for the piece to fall and then slide into place. In Figure 3, the player needs to slide the ‘I’ underneath the ‘Z’. Once the two pieces are level with each other, as shown in the picture on the left, the player may press and hold the right arrow. When the ‘I’ locks into place, as in the picture on the right, the player may continue on to the next falling piece. Now, depending on your preference, or what situation you’ve gotten yourself into (do you find yourself in a room full of people, holding a Tetris tournament? ), you’ll want to cater to one of Tetris’s multiple strategies. Some players vie for the highest point score, while other players find it just as fun to compete for the most lines. If you’ve decided to try and attain the most points, one way to do this is to clear 4 lines at once, The best way to achieve this is by stacking the blocks all the way to the right or left, leaving an empty column. In Figure 4, the empty column has been left on the left side of the screen. Once the blocks are stacked up high enough (you will need at least 4 rows), wait for an ‘I’ piece to arrive. Most Tetris games will show you the next piece, which can be helpful at times. When it arrives, stick it into the empty column, as shown here in Figure 4 with the orange colored ‘I’ piece. Clearing 4 lines at once is called a ‘Tetris’. 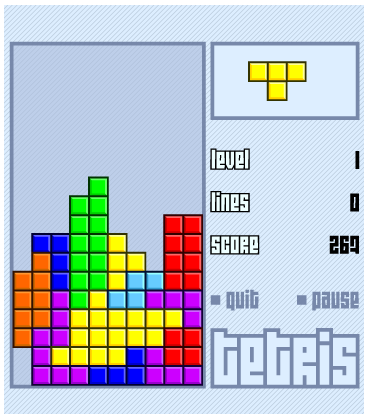 In the original Nintendo version of the game, a funny sound was made when a Tetris was completed. 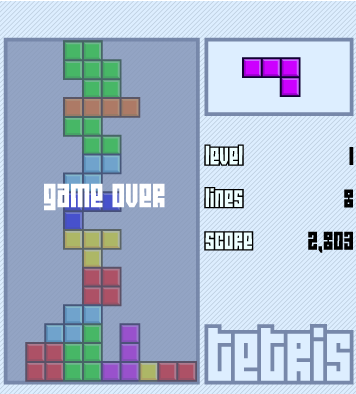 Creating a Tetris will result in the most points. If multiple Tetrises are created consecutively, the points will start to stack up. Unfortunately, this technique can be risky. By stacking up blocks all the way to one side and as high as possible, you are limiting yourself with pieces that will help you progress. The player is also limiting their workspace. They will have to make quicker decisions because they will have less space and time to drop the falling piece. Because the pieces fall at random, you are not always going to get ‘I’ pieces to put down the empty column, and you may find yourself having to block the hole with something else. You can always come back to it, once you’ve cleared the way again, but it can be a risky path to take. Alternating between Tetrises and single, double, or triple rows can be just as advantageous. 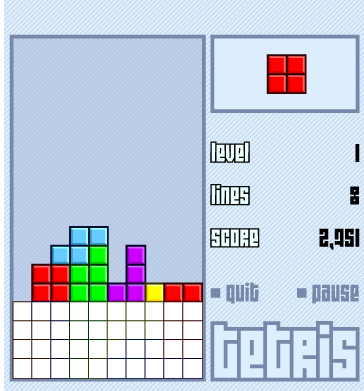 When taking points into consideration, Tetris has what is called a ‘hard drop’. Depending on the game’s controls, this can be done by hitting enter, the space bar, or whatever key is designated to do so. Instead of the piece falling more rapidly to the bottom, it will basically just drop to the bottom, and usually scores the player more points. Be careful though. If the piece is not properly lined up, which happens when you’ve been playing for 5 hours at a time, a hard drop is going to cause you problems. You can’t take it back once it’s done, and you’ll have to play around the mistake. But if you feel up for the challenge, you’ll be rewarded with extra points. If you’ve chosen to take the path of simply accumulating the most lines, Tetrises will still be helpful, but you may want to simply keep your rows on screen to a minimum. Once you get to the higher levels and the pieces are coming at you quite rapidly, one has less time to think and consecutive Tetrises are completely out of the question. It will be easier to simply clear 1-3 lines at once instead of waiting for that illusive ‘I’ piece, which never seems to come when you need it. By keeping your screen clear, you’ll have more time to think about where to put each piece, and you’ll be able to last longer in the game because you’ll have more room for error. Fixing a mistake is not always easy when you only have half or less than half of a screen to do it in. Clearing fewer lines at once will also take time, so one definitely has to have patience.